I happen to be one of those rare piano teachers with a special fondness for adult beginners. Maybe it’s because I’m always learning something new myself, and appreciate other adults who take the time and effort to learn something as incredible and challenging as the piano. In addition to my musical training, I hold a master’s degree in Adult Education. 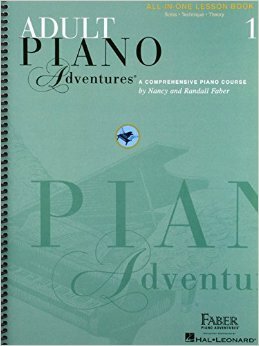 Along with my teaching and playing experience, this has given me an even deeper understanding of what it takes to learn the piano, and how to coordinate the many skills involved – motor skills, reading skills, ear skills, memory skills, rhythmic skills, practicing skills, and the list goes on. If you’re an adult beginner, read on for answers to some common questions, and to learn what to expect at lessons. Do I Need a Piano or Keyboard Before Starting? Yes. If you’re not ready to buy one, though, many stores have rental or rent-to-own programs. Learn more about choosing an instrument. It hardly works for most adults to learn musical styles or skills that don’t interest them. Adults want to know why they should learn something. I strive to learn as much as I can about your previous musical education (if any) and your learning objectives and musical interests. Still, I may encourage you to consider the value of acquiring certain skills you may not have considered, like improvising or “sight playing” music. Most musical skills are building blocks of other skills. The more blocks you have, the sturdier your foundation will be. First lessons are exciting for both student and teacher (at least they are for me.) It’s an opportunity for you to consider the fit between you and your prospective teacher – both musical and personal – and to begin the learning process. When my schedule allows, I take extra time for the first lesson (sometimes up to 90 minutes) to get to know you and your musical strengths and weaknesses as best I can. Over the first few lessons we’ll work out a plan to get you quickly and efficiently to your goals, to correct any weaknesses, and to build on your strengths. For example, if your sense of rhythm is weak compared to your ear, I’ll strongly encourage you to put more time into practicing rhythm. Nearly all piano teachers use one or more method books designed for adults, and I’m no exception. A good method offers a thorough yet gradual approach to learning the many skills a pianist needs, which makes the process less intimidating. Most of my adult beginners use one of the two most popular methods, Alfred or Faber (the latter the current favorite of American music teachers). Sometimes, though, I will choose another method based on a student’s unique interests. If your goal is to play classical music, you’ll enjoy either of the above methods, which include famous classical melodies from the very beginning. Eventually you will leave method books behind and play real classical music appropriate for advanced beginners such as small masterpieces by Bach, Beethoven, and other great composers. If you’re interested in American styles like blues, jazz or rock I’ll recommend you use my method 88 Keys to the Blues. All my adult students use my comprehensive method, The Creative Keyboardist, which includes basic-to-advanced material and numerous exercises on ear training, reading skills, keyboard technique, harmony, scales, practicing skills, and much more. Learn more about The Creative Keyboardist and 88 Keys to the Blues. I love it when beginners get that learning the piano isn’t an overnight project. The piano, being a key instrument in so many musical styles – classical, jazz, blues (and if you include electronic instruments, everything from classic rock to hip hop) – holds an infinite well of possibility. A keyboard player can spend her entire life, no matter how good she gets, playing fresh and ever more difficult music. Recognizing that a long-term approach is necessary for proficiency or mastery, you’ll relax and learn to appreciate the music you can play now, rather than being frustrated by what you cannot yet play. In other words, appreciating your current skill level while striving for more advanced skills provides the most enjoyment and the highest probability that you’ll continue growing as a musician for the rest of your life. Learn the nitty-gritty about instruction for adults, including fees and locations. Have a question? Ready to start? Contact me. Want to learn more? Check out 11 Tips for Beginning Adults. Not sure if I’m the right guy? Read my tips for finding the right teacher.